It’s hard being a dog parent. When your baby gets sick, they can’t tell you how they feel. I feel helpless when she’s uncomfortable because I can’t fix it instantly. 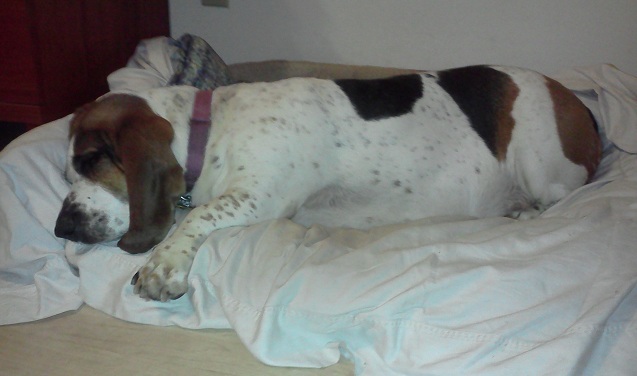 My rescue basset hound Rosie and I have been on rollercoaster with her health lately. A few weeks ago I came home and caught Rosie up on the couch (bad dog). When she jumped down and lay on the floor I noticed she was breathing kind of hard. That was odd because I didn’t think I surprised her that much. I let it go and went on with my day. About an hour later I checked on her and she was still breathing hard. That wasn’t normal so I called the vet and got her an appointment within the hour. The vet said her lungs and heart sounded good and she was oxygenating well so we decided on wait-and-see approach. She said to bring her back if she got worse or exhibited new symptoms – like lack of appetite. That night she wasn’t very hungry. I put her to bed with the thought, “Please still be alive in the morning.” The next morning she wouldn’t eat at all so we zipped back to the vet for a 7:30am appointment. The x-rays showed systematic lung inflammation so we ran blood work. 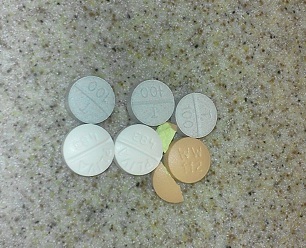 By the end of the next day, she was on a steroid, an antihistamine, and an antibiotic. This was Ruth and Rosie’s first joint adventure with pills. Let me tell you, she doesn’t like them. She put up a fight when I put them in the back of her mouth and held her jaws shut. It took three attempts to get them all down the first time. 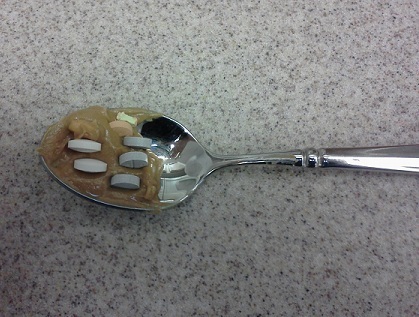 Thankfully one of my fellow dog parents recommended putting her pills in peanut butter. That fixed everything and it’s really cute to watch her lick peanut butter off the spoon. The steroids make her really thirsty so instead of drinking a bowl of water every day, she’ll drink a bowl of water every 4 hours. All that liquid has to go somewhere and there have been a few accidents while I was out of the house and during the night. Thankfully she does it on the tile where it’s easy to clean. Of course when you can’t breathe, you can’t go for walks so we had to stop walking completely for a few days and now we’re doing short walks every other day until she’s totally better and gets her stamina back. I’m sure her doggy friends miss her. I noticed she was adjusting her blankets into a ball and laying her head on it sometimes. I thought that might have made her more comfortable to keep her head and spine in alignment. I tried to make things easier for her by adding a pillow to her bed. She pushed it out of her way and ignored it. 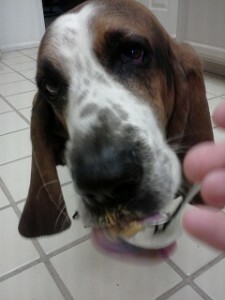 Rosie will be done with all of her meds this week, but there’s a chance she has valley fever. She tested low positive for it, which means she’s either had it or she just got it, and since she’s a rescue dog, I don’t know her full history. We’re going to re-test her white blood count when she’s off the antibiotics. If it’s still elevated, we’ll treat for valley fever. It’s amazing how easily we fall in love with our pets and how heartbreaking it is when they hurt. I can’t wait for my baby to be well again.